Among his other talents (See My Superhero Boyfriend and his One Weakness for more information), BF is an amazing cook. It’s great for my taste buds, but bad for my waistline. In the last few years I’ve gained more weight than I care to emblazon for all to read, but let’s just say it’s too much. So, in an effort to decrease my remorse every time I step on a scale, I’ve ramped up my workout routine and started myself on a diet. As if starving myself isn’t bad enough, I’m now responsible for cooking my own meals. Every day after work I head to the grocery store and try to find something low-calorie, low carb and still flavorful…not an easy task. I was in the produce section a few weeks ago debating between brussel sprouts or broccoli when the most glamorous woman I’ve even seen walked by me and picked up a red pepper. Everything about her was flawless. From the hair, through the makeup, around the outfit and even down to her designer eco-friendly shopping bags, she was the complete package of what a classy woman should be. If they were alive today, Princess Diana and Jackie Onassis would both have bowed down and acquiesced to her superiority as a woman of style. Enamored by this goddess who had graced me with her presence; I abandoned my food shopping and followed her throughout the store. I wanted to know what a woman of such high-caliber ate. I stood behind her as she ordered two pounds of Alaskan king crab legs from the seafood department; I hid behind the mylar balloon display as she rifled through the exotic fruits section for pomegranates, star fruit and kiwis; and I almost blew my cover when I knocked over a mid-aisle display trying to see if she was buying Perrier or plan bottled water…it was Perrier. As she pulled up to the checkout lane I found myself fantasizing about where she lived, what she and I would talk about if we were friend and what might be her favorite color. I was obsessed with this woman with whom I’d just seen a few minutes before. But, like all fantasies, it did not live up to reality. Instead she pulled out the all-too familiar green and orange Georgia Compass Card. For those of you who don’t know what that is, the Georgia Compass Card is basically and electronic version of food stamps. They give it to families so they don’t have to suffer the social embarrassment of using old-fashioned food stamps. As the cashier swiped her card, my heart fell down to the soles of my shoes. How could this picture of poise and womanhood possibly be using food stamps, especially when her outfit had to cost more than my monthly mortgage? Then, as I stood there dumfounded watching this Food Stamp Fashionista pack her bags full of high-priced food, it hit me. Of course she can afford all those great clothes because she doesn’t pay a cent for food. That whole night I kept getting more and more upset. Not only did this decepticon of a person obviously not need food stamps, she was probably stealing them away from someone who did. Although I have some issues with public services programs, there are some people who really need them and sincerely appreciate how they increase their quality of life. The fake woman in the store only used them so she could buy expense perfume and high quality hair extensions. I planned my revenge and waited every day at the grocery store after work for that Food Stamp Fashionista to return. It took a couple of weeks, but I finally saw her one night leafing through the pre-made gourmet meals adjacent to the deli counter. Again, I followed her through the entire store, but this time I had a different motive. When she pulled up to the cashier and handed him that green and orange card I said, loud enough for everyone in the adjacent two aisles to hear “Is that a new type of credit card?” She turned around to me, lowered her Gucci sunglasses and shot dagger at me through her eyes. The cashier, who I think was onto what I was trying to do, held the card up and said “This? No. It’s her food stamp card.” Embarrassed, Food Stamp Fashionista pushed up her sunglasses, turned up the color on her fur-lined leather jacket and skulked out of the store. It was a small victory for me, but a huge win for tax payers state-wide. 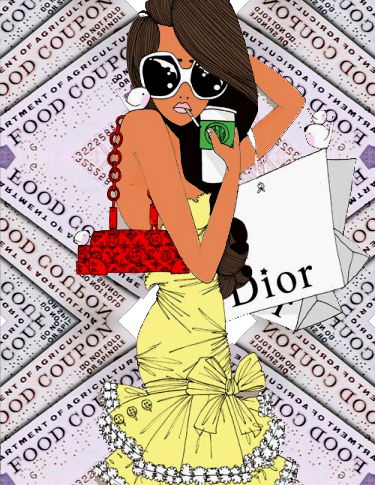 My advice to Food Stamp Fashionistas: 1) Don’t apply for food stamps unless you need them. 2) If you do get food stamps, don’t try to hide them behind a nice wallet and an expensive purse and 3) Watch out the next time you’re at the grocery store for a disgruntled architect on a diet because he’s mad. My advice to everyone else: Don’t the let hypocrisy of Food Stamp Fashionistas continue. Call them out for stealing your hard-earned tax dollars. Undoubtedly what you assumed to be true may have been true. That woman may have been rich and using the card to steal food from Georgians everywhere. However, she may have been formerly “wealthy” or simply had money in the past but behaved irresponsibly with it. She may be poor now and suffering. If she had lost everything in our broken economy, as countless others have, would you expect her to stop wearing her favorite clothes? Especially when she goes out? ESPECIALLY when she might be spotted using her food stamps?? And if she was stealing from taxpayers, why would someone who is so obviously concerned with her outward appearance be so unconcerned with how it looks when someone has to use a food stamp card? I understand your initial disgust with what you believed to be a thief. But having to go on food stamps is hard enough without the extra embarrassment. I hope you never find yourself in a similar situation. As a cashier at a grocery store I see these people all the time. Today I had one come through my line with her friend (both on foodstamps) and they were talking to each other when her friend mentioned how she liked her purse. Yeah, her Tommy Hilfiger purse. Seriously? I buy bags at Target so you can spend my money on food and then buy designer bags? Hmm. That sounds pretty… annoying. That makes me rage almost as the people who buy more junk food than a human should eat in their lifetime let alone one week’s worth of groceries. To help fight the stigma against using food stamps. There is new product out in the market called food stamps skins which allow people to personalize their EBT card and protect their privacy! you can check it out here http://www.foodstampscovers.com ..